Otago 2-142 (Brendon McCullum 83*, Derek de Boorder 30*, Samiullah Khan 1-18) beat Faisalabad Wolves 8-139 (Misbah-ul-Haq 46, Khurram Shehzad 27, Ian Butler 2-23, James McMillan 2-24) by eight wickets. The skipper of Otago, Brendon McCullum, castigated the ordinary looking bowling attack of Faisalabad Wolves who surrendered in the 1st qualifying game. Faisalabad Wolves scored 139 runs with two wickets remaining in the measured 20 overs and Otago Volts powered 142 for the loss of just two wickets and 13 balls still available. 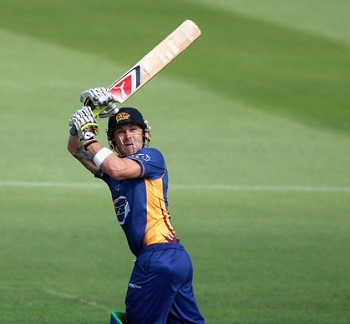 Brendon McCullum (Otago) was declared ‘Player of the match’ for his attacking knock of 83 off just 65 deliveries. The first qualifying of the Champions League Twenty20 was played on Tuesday, September 17, 2013, at Punjab Cricket Association Stadium, Mohali, Chandigarh. Earlier, Misbah-ul-Haq, the captain of Faisalabad Wolves, won the toss and opted to set a target on a good looking surface. The decision bounced back since their openers were dismissed for just 12 runs in 3.2 overs. Khurram Shahzad and Asif Ali got in under trying conditions and the latter hit 3 fours in the following overs. Asif Ali left the scene at 34 after scoring 14 runs and Misbah-ul-Haq tried to consolidate the innings with his partner. The skipper hit 1 six and 2 fours until the 13th over and added another 2 sixes and 1 four in the next one. Khurram Shehzad became the next victim for 27 off 36 balls with 3 fours and the middle and lower order batting was unable to give a real fight. It was left to Misbah-ul-Haq who became the next victim at his personal feat of 46 from 34 deliveries with 3 lofty sixes and 4 fours. Faisalabad Wolves managed 139 runs for the loss of eight wickets at the end of the 20th over. Ian Butler, James McMillan and James Neesham were the top wicket takers with two wickets each whereas Neil Wagner claimed one. Otago faced an early blow when their opener, Neil Broom, was caught by Khurram Shehzad at first slip on the second ball for a duck. Brendon McCullum got together with Hamish Rutherford and the first got off with two back to back fours. The latter dispatched 3 sixes and 1 four in the coming overs and was caught by Asif Ali at deep midwicket off Saeed Ajmal for 25. The second wicket fell at 41 in 5.2 overs as Derek de Boorder appeared in the park next and the score was taken to 67 after the first 11 overs. The duo accumulated 17 runs in the next one with 1 six and 2 fours while McCullum was dropped at 41. He smashed his 23rd T20 fifty in the 15th over which produced 15 runs and the score went past the hundred runs mark as well. Brendon McCullum carried on with his assault by punishing the rival bowlers at will and hit the winning four on the fifth ball of the 18th over. He remained unbeaten at 83 off 65 mere balls with 2 big sixes and 9 fours, Derek de Boorder secured his end for 30 as Otago achieved the target by plundering 2-142 in 17.5 overs. Samiullah Khan and Saeed Ajmal were the only successful bowlers with one wicket each among the six used. Otago Volts triumphed in the encounter by a hefty margin of eight wickets and got four useful points.